William Gary Busey (/ˈbjuːsi/; born June 29, 1944) is an American actor. He has appeared in over 150 films, including Lethal Weapon (1987), Predator 2 (1990), Point Break (1991), Under Siege (1992), The Firm (1993), Carried Away (1996), Black Sheep (1996), Lost Highway (1997), Fear and Loathing in Las Vegas (1998), The Gingerdead Man (2005) and Piranha 3DD (2012). Busey also made guest appearances on shows such as Gunsmoke, Walker, Texas Ranger, Law & Order, Scrubs, and Entourage. Busey was born in Goose Creek, Texas, the son of Sadie Virginia (née Arnett), a homemaker, and Delmer Lloyd Busey, a construction design manager. He graduated from Nathan Hale High School in Tulsa, Oklahoma in 1962. While attending Pittsburg State University in Pittsburg, Kansas on a football scholarship, he became interested in acting. He then transferred to Oklahoma State University in Stillwater, Oklahoma, where he quit school just one class short of graduation. 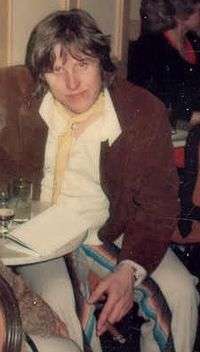 Busey began his show business career as a drummer in The Rubber Band. He appears on several Leon Russell recordings, credited as playing drums under the names "Teddy Jack Eddy" and "Sprunk", a character he created when he was a cast member of a local television comedy show in Tulsa, Oklahoma, called The Uncanny Film Festival and Camp Meeting on station KTUL (which starred fellow Tulsan Gailard Sartain as "Dr. Mazeppa Pompazoidi"). For his skits on Uncanny Film Festival, Busey drew on his American Hero, belligerent, know-it-all character. When he told Gailard Sartain his character needed a name, Sartain replied, "Take three: Teddy, Jack and Eddy." In 1974, Busey made his major film debut with a supporting role in Michael Cimino's buddy action caper Thunderbolt and Lightfoot, starring Clint Eastwood and Jeff Bridges. In 1976, he was hired by Barbra Streisand and her producer-boyfriend Jon Peters to play Bobby Ritchie, road manager to Kris Kristofferson's character in the remake film A Star is Born. On the DVD commentary of the film, Streisand says Busey was great and that she had seen him on a TV series and thought he had the right qualities to play the role. In 1978, he starred as rock legend Buddy Holly in The Buddy Holly Story with Sartain as The Big Bopper. For his performance, Busey received the greatest critical acclaim of his career and the movie earned Busey an Academy Award nomination for Best Actor and the National Society of Film Critics' Best Actor award. In the same year he also starred in the small yet acclaimed drama Straight Time and the surfing movie Big Wednesday, which is now a minor cult classic. In the 1980s, Busey's roles included the critically acclaimed western Barbarosa, the comedies D.C. Cab and Insignificance, and the Stephen King adaptation Silver Bullet. He played one of the primary antagonists opposite Mel Gibson and Danny Glover in the action comedy Lethal Weapon. In 2003, Busey starred in a Comedy Central reality show, I'm with Busey. In 2005, he also voiced himself in an episode of The Simpsons and appeared in the popular miniseries Into the West. Busey controversially appeared in the 2006 Turkish nationalist film Valley of the Wolves: Iraq, (Kurtlar Vadisi: Irak, in Turkish), which was accused of fascism, anti-Americanism and anti-Semitism. In 2007, he appeared as himself in a prominent recurring role on HBO's Entourage, in which he parodied his eccentric image, ultimately appearing on three episodes of the show. In 2008, he joined the second season of the reality show Celebrity Rehab with Dr. Drew. Busey returned to reality television in Celebrity Apprentice 4, which premiered in March 2011, and appeared again in Celebrity Apprentice 6. There, he briefly reprised his role as Buddy Holly by performing "Not Fade Away". In a series of 2010 YouTube advertisements for Vitamin Water, Busey appeared as Norman Tugwater, a lawyer who defends professional athletes' entitlements to a cut from Fantasy Football team owners. On September 1, 2015, it was announced that he will be competing on the 21st season of Dancing with the Stars. He was paired with professional dancer Anna Trebunskaya. Busey and Trebunskaya made it to Week 4 of competition but were then eliminated and finished in 10th place. In 1971, Busey's wife Judy Helkenberg gave birth to their son, William Jacob "Jake" Busey. Busey and Helkenberg divorced when Jake was 19 years old. Busey has a daughter named Alectra from a previous relationship. In February 2010, Busey's fiancee Steffanie Sampson gave birth to their son, Luke Sampson Busey. On December 4, 1988, Busey was severely injured in a motorcycle accident in which he was not wearing a helmet. His skull was fractured, and doctors feared he suffered permanent brain damage. 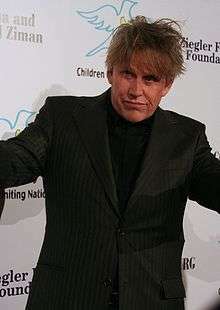 During the filming of the second season of Celebrity Rehab in 2008, Busey was referred to psychiatrist Dr. Charles Sophy. Sophy suspected that Busey's brain injury has had a greater effect on him than realized. He described it as essentially weakening his mental "filters" and causing him to speak and act impulsively. Sophy recommended Busey take valproic acid (Depakote), with which Busey agreed. In 1996, Busey publicly announced that he was a Christian, saying: "I am proud to tell Hollywood I am a Christian. For the first time I am now free to be myself." This return to Christianity occurred as a result of his motorcycle accident, as well as a 1995 cocaine overdose. In 2011, Busey supported Donald Trump's 2012 presidential bid saying, "For the American people, vote for Donald Trump come election night." In 2015, he again endorsed Trump for president. ↑ "Texas Births, 1926–1995". familytreelegends.com. Retrieved December 19, 2010. ↑ "Gary Busey Biography (1923)". ↑ "Gary Busey". eBiog. Retrieved August 5, 2007. 1 2 3 Tulsa TV Memories.com, Gary Busey reference as Teddy Jack Eddy in Tulsa, OK.
↑ "On a Clear Day I Can't See My Sister". The Simpsons. Season 16. Episode 11. 2005-06-03. Fox. ↑ "Turkish rush to embrace anti-US film". BBC News. February 10, 2006. Retrieved May 3, 2010. ↑ "Turkish Film Uproar: Attacking the American Enemy on Screen – International – Spiegel Online – News". Der Spiegel. February 22, 2006. Retrieved January 7, 2012. ↑ Wright, Adam (November 18, 2010). "Celebrity Apprentice Season Four Cast Revealed". TVDoneWright.com. ↑ Cassens Weiss, Debra (August 30, 2010). "'Lawyer Norman Tugwater' Ready to Sue for Pro Athletes' Fantasy Rights". ABA Journal. American Bar Association. ↑ "'Dancing with the Stars' Recap: Most Memorable Years for the Top 10". buddytv.com. Retrieved October 5, 2015. ↑ James Peragine. "First Photos: Gary Busey Introduces Son Luke". ↑ Kate Stanhope. "Gary Busey and Girlfriend Are Expecting". TVGuide.com. ↑ Moran, W. Reed (July 5, 2001). "Gary Busey ministers to brain injury community". USA Today. Retrieved August 5, 2007. ↑ "Celebrity Rehab 2 with Dr. Drew , Episode 2 , VH1.com". Retrieved March 26, 2009. ↑ Cramberg, Joanne. "Tulsa's 'Bad Boy' Gary Busey Accepts Jesus". Retrieved April 29, 2013. ↑ Virtue, David. "Rescued From The Present Evil Age". Retrieved April 29, 2013. ↑ "Gary Busey On His Life-Changing Cocaine Overdose And Motorcycle Accident (VIDEO)". Huffington Post/Oprah Winfrey Network. January 21, 2014. Retrieved July 24, 2016. ↑ Gary Busey Endorses Donald Trump for President. People Video. April 29, 2011. Retrieved September 17, 2016. ↑ Powers, Lindsay (April 18, 2011). "Gary Busey Endorses Donald Trump for President". Hollywood Reporter. Retrieved October 20, 2016. ↑ Glines, Carole (September 15, 2015). "Donald Trump gets coveted Gary Busey endorsement ahead of big debate". Fox News. Retrieved October 20, 2016. ↑ "'Two and a Half Men': Gary Busey joins as a mental patient – From Inside the Box – Zap2it". Blog.zap2it.com. November 4, 2011. Retrieved January 7, 2012. 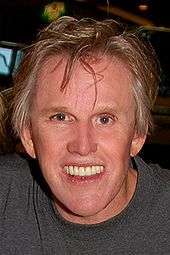 Wikimedia Commons has media related to Gary Busey.